If you have fine pieces of artwork, decorative display areas or other features that you want to illustrate with beautiful clarity, the addition of spotlights is a great idea. You can shine light on these special features in your home by installing	 a single, bright fixture with a focused beam overhead, or you can use track lighting to highlight larger features. In some cases, the design or layout of your room may be sufficient to allow lighting to be placed at eye-level or even below the fixture to shine upward at it. 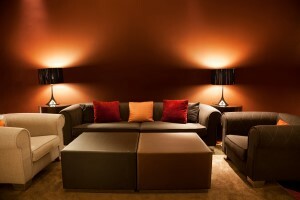 While spotlights can shine a focused beam of light on fixtures, you can also use background lighting for ambiance. Consider how you can incorporate background lighting with under-cabinet kitchen lighting, dimmer recessed lighting placed behind a sofa or other features. Generally, these are lights that do not provide direct lighting, and the light may not be the main source of light in the room. It may even have a hint of colour to it for a dramatic flair that further establishes ambiance. Another idea is to use beautiful or decorative lamps in your room. These may be smaller desk lamps, towering floor lamps or table top lamps. There are lamps available in a wide range of colours, sizes and styles. The lighting from the lamps may influence ambiance and provide functional lighting, but the decorative nature of the lamps themselves can enhance the décor even when the lights are not turned on. There are many different types of lighting that can influence your home's décor, and in many cases, it makes sense to incorporate each of these styles of lighting in a single room to enjoy different benefits. You can study your rooms' layouts and designs today to learn more about how the existing light fixtures influence décor, and you can make a few appropriate changes to enjoy better overall results for your space.